Home TravelTips Travelling to Myanmar without Visiting Yangon? Where Will You Go? 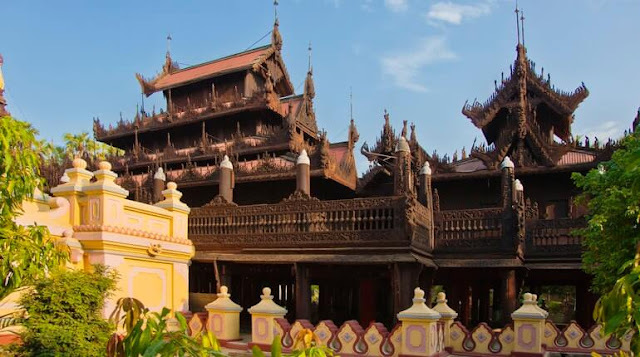 Travelling to Myanmar without Visiting Yangon? Where Will You Go? 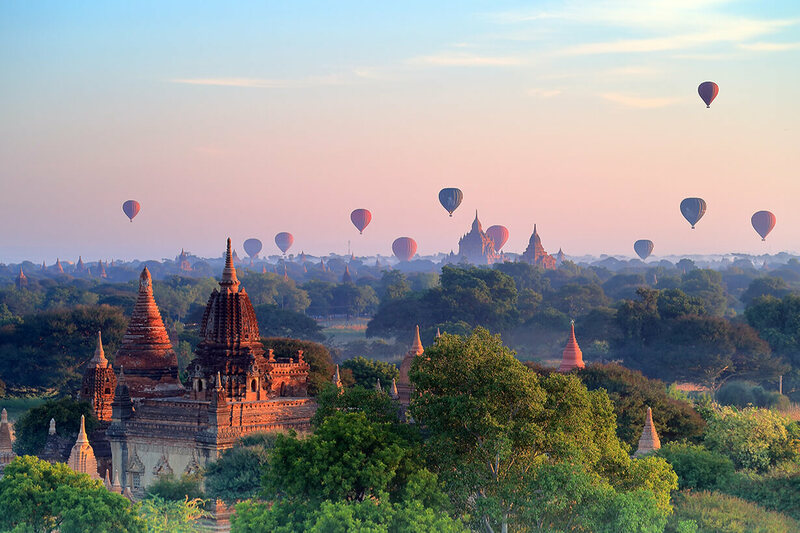 Although Myanmar recently opened its door for tourism, it quickly becomes one of the most desirable attractions in the Southeast Asia for a slew of exotic and interesting destinations. Although Myanmar recently opened its door for tourism, it quickly becomes one of the most desirable attractions in the Southeast Asia for a slew of exotic and interesting destinations. Coming to this country, you can easily be overwhelmed by thousand magnificent Buddhist constructions rising across the country with the elaborated design and distinctive architecture. Let’s take a look at some of the most famous tourist attractions in Burma. Mandalay is the second largest city of Myanmar which is also the last royal capital of the golden land. It is a religious center of the country with numerous elaborated temples and monasteries scattered all over the place and its surrounding areas. Mandalay’s must visit sites include: the wooden monastery Shwenandaw, Kuthodaw paya and the world’s largest book, Mandalay hill, the royal palace, Mahamuni pagoda and the Buddha like golden statue, U Bein bridge – the longest teak wood bridge and the Amarapura monastery. 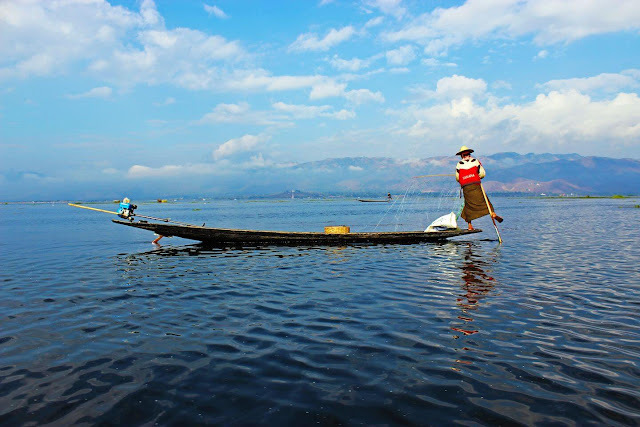 Now, to visit Mandalay, travellers can choose to take a land tour or for an upscale holiday, a river cruise in Irrawaddy River between Mandalay and Bagan with The Strand Cruise is a perfect idea. Shweinbin Pagoda: This is the biggest and most impressive monastery in Mandalay finished completely in teak wood. Furthermore, tourists will be overwhelmed by the sophisticated architecture of multi –tiered spire roofs rising up in the sky and the elegant carving patterns of the construction. The building is one in a few buildings standing the test of time with the coat turned into a mysterious black color. Mahamuni Paya: Just like Shwedagon pagoda and the Golden rock, Mahamuni paya plays an important role in Burmese Buddhist culture. The construction was built in the 1784 featuring the 5 ton golden Buddha likeliest image, was brought from Mark U, Rakhine state. The statue is said to be existed from the 1st century but Raskhine devotees believe that its origin dated back to the 500 BC when the Gautama visited this place. 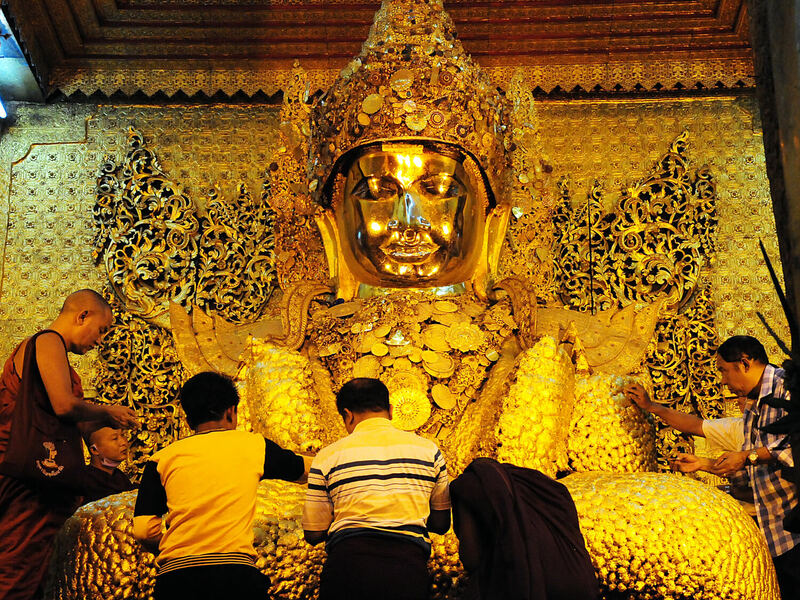 To show respect to the Buddha, people apply gold leaves to the statue’s body but only men can do it owing to the strict rules of the Myanmar Buddhism. 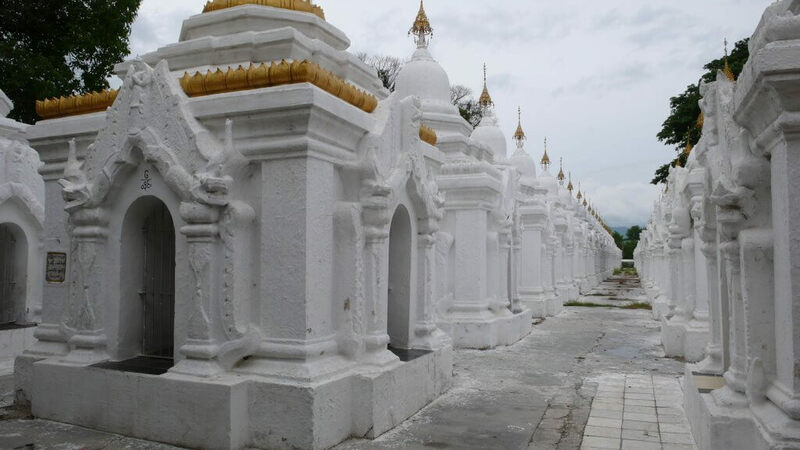 Kuthodaw pagoda and the world’s largest book: Located at the foot of Mandalay hill, the gilded Kuthodaw pagoda and its surrounding 729 white stupas stand out in the massive area. This complex was built under the order of King Mindon accompanied with the construction of the royal palace. Each shrine contains a marble slap which inscribed the text of Tripitaka (the teaching of Buddha). People said that if you spend 8 hours a day to read, it will take 450 days to finish reading the inscriptions in the slaps. With more than 2000 Buddhist constructions survive till the present day out of 10,000 ones built from 11th to 13th century, Bagan is probably the most famous temples complex in Myanmar. It is once the capital of the golden land in the ruling of the mighty King – Anawrahta (also used to name for Anawrahta Cruise). Some notable sites in Bagan: The golden pagoda Shwezigon, Ananda temple and its 4 golden standing Buddha statue in 4 entrances, the highest temple – Thatbyinnyu, Shwegugyi temple and Shwesandaw temple where preserves the hair of the Gautama. The special about this site that attracts not only locals but also foreigners is the enormous rock lies in the edge of the vertical cliff in Kyaikhto mountain. 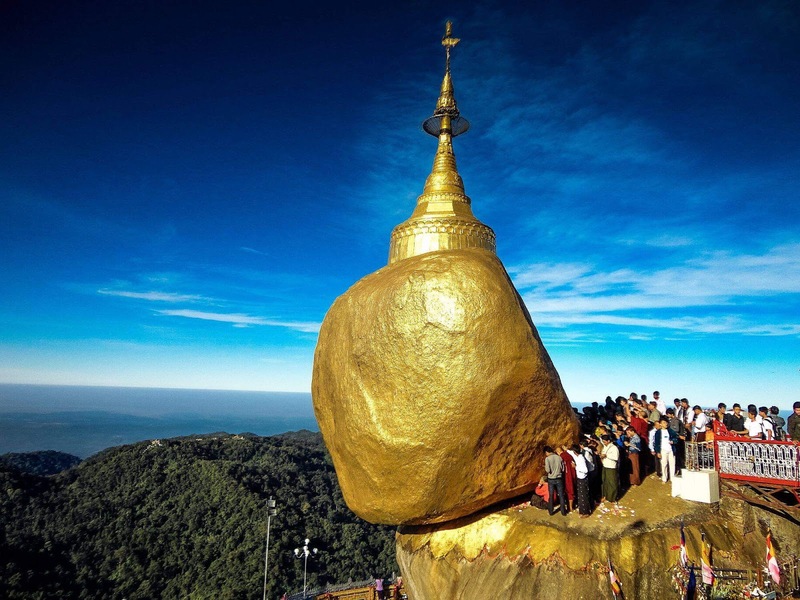 This rock has the golden coat and on the top set a small stupa preserving the strand of the Buddha’s hair. It has stood here for more than 2500 years challenging the power of gravity. Inle lake is one destination that cannot be missed in Myanmar. This second largest body of water draws the attention of the tourists with its picturesque landscapes and the authentic local life on the lake. Coming to this place, you will also have a chance to visit the outstanding Phaung DawOo pagoda and its 5 gilded Buddha statues, the long neck village – Pa - O and have a glass of wine and watch the sunset in the Red Mountain Estate Vineyards & Winery. 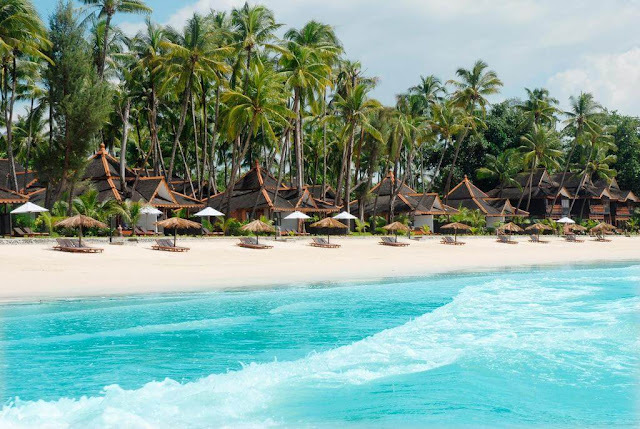 Beaches in Burma are almost untouched and pristine because they are recently explored, so that Myanmar Beach Holidays are more and more interesting to tourists who love leisure travelling. Setting along the bay of Bengal, the beaches are blessed with the stunning sand shore and clear blue water that charm any tourists coming to these tropical paradises. Some famous beaches that you can enjoy are: Ngapali, Ngwe Saung, in which Ngapali is one of the most beautiful beaches in Asia and Myanmar alone with the long palm – fringed shore, white soft sand and turquoise water. Or for more of a fantastic holiday, don't hesitate to take a look at our Mergui Archipelago Tours and find a good trip in a one-of-a-kind destination!